Diode Dynamics: SL1 LED Headlights for 2015+ Ford F150! USA Made! Plug & Play! Diode Dynamics is pleased to offer the USA-made SL1 LED headlight for 2015+ Ford F150 applications. SL1 LED Headlight. If you're looking to improve visibility in your F150 at night, you've probably seen options available for LED upgrades. There's plenty of LED bulbs on the market, but they all have their shortcomings. They're too big to install, have no hotspot in the beam pattern, or they simply stop working after just a few months. With its compact size, optically correct output, thermally-modeled cooling, and boost-mode electrical circuit, the Diode Dynamics' SL1 LED finally provides a true upgrade in performance. Street Legal Output. Don't be fooled by high lumen numbers or "projector specific" bulbs. Your F150's headlights are designed to focus light. If the light source is out of focus, it doesn't matter how bright it is - you won't have a focused hotspot of light to shine down the road - just more glare. To correct this, the Diode Dynamics' SL1 LED headlight bulb was engineered with advanced optical design software, to perfectly match filament location. This allows the SL1 LED to focus light just like an original bulb, preserving the focus and hotspot, with no added glare. It produces a functional beam pattern on the road, in compliance with photometric standards, for a safe, functional output, which we call Street Legal. Tested to Perform. We test the SL1 bulb in factory Ford F150 headlamps, and measure the entire beam pattern using specialized equipment. It's an elaborate affair: a headlight is mounted to a computer-controlled rotating head called a goniometer. Light shines down a tunnel, where a sensor collects data as the headlight is rotated. The entire beam pattern is mapped, and we compare the total output to the original halogen, confirming that the SL1 bulb shines more light in the hotspot, without adding extra glare on the road. 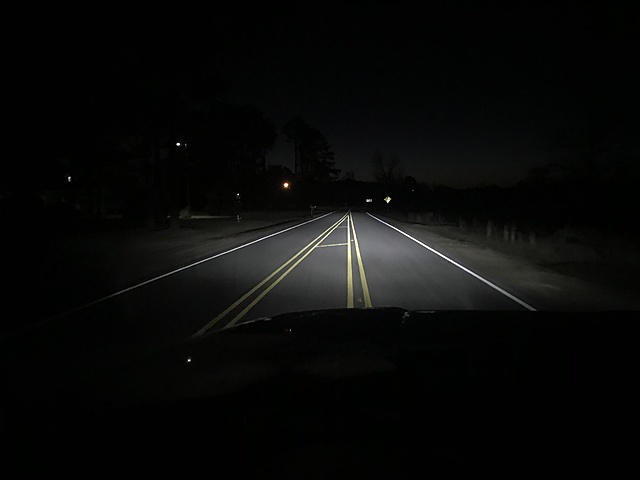 The test results speak for themselves: in most lamps, like the 2015 F-150 Halogen lamp below, there is 30-70% more light in the critical hotspot, with no added glare or spread of light. With optical engineering, testing, and validation in the application, we can assure correct optical performance. Fitment. 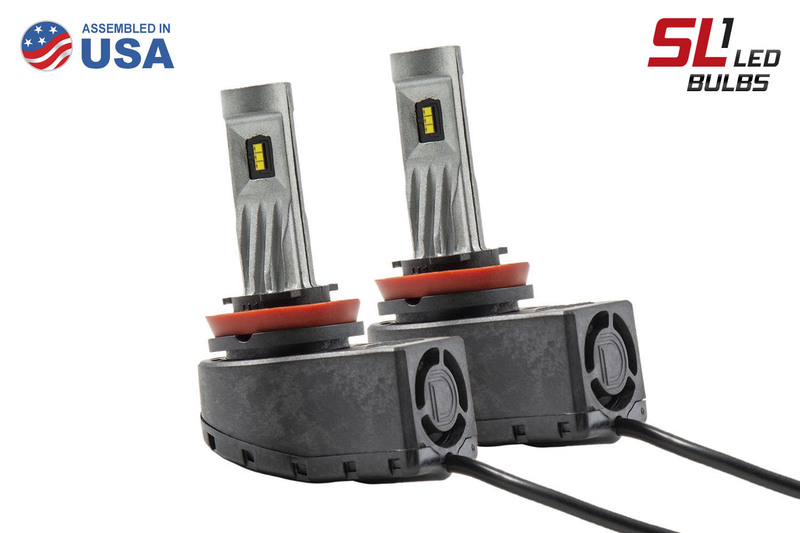 With its patented design, the Diode Dynamics SL1 LED fits where other bulbs won't, without cutting or modification. There's no hanging metal straps, just a compact bulb that plugs right in, with a nylon-reinforced shroud. Only slightly larger than a standard halogen bulb, it fits behind dust caps and in tight spaces. The base sizes are keyed for exact applications, not one-size-fits-all, and the compact driver easily tucks away. Last edited by Diode Dynamics; 08-30-2018 at 11:26 AM. Sent you guys an email today. Website says these bulbs and everything else I'd like to order is backordered. There is a non-biased, customer-submitted output shot currently on that listing showing the output from the driver's seat. In the initial post for the thread, we also have a chart from our engineer's photometric testing data with the SL1 in the 2015+ F-150's reflector style headlight housing. It shows an exact map of the output pattern, which is identical to the OEM halogen housings, but with considerably more hotspot lux further down the road. The SL1 is the most engineered, validated LED headlight bulb on the market, and the only USA-made one too! What is the lifespan, or service hours for the SL1 bulbs? We rate all our LED bulbs for 40,000 hours of use, and back them with a 3-year worry-free warranty. 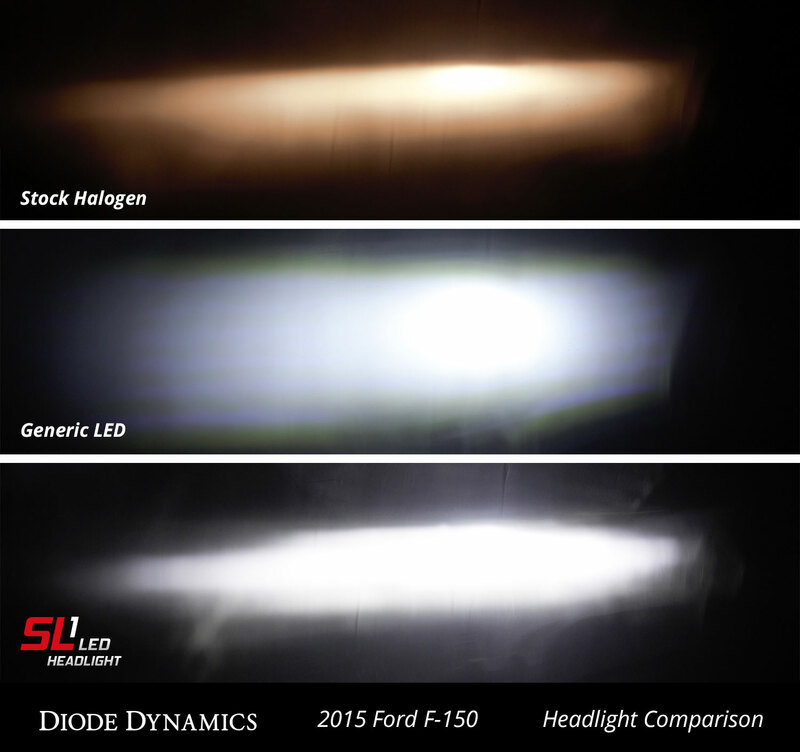 Quick Reply: Diode Dynamics: SL1 LED Headlights for 2015+ Ford F150! USA Made! Plug & Play!